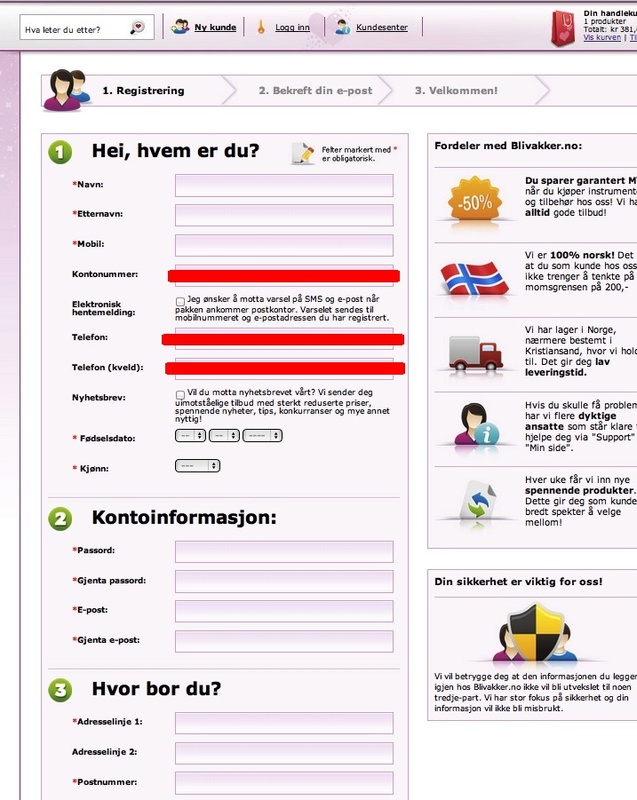 Blivakker.no is Norway´s leading online beauty shop with approx. 20 000 visits per day. In September 2012, they performed an A/B-test of the site registration form using Visualwebsiteoptimizer.com. They were aware that the site had an overly complicated registration process, but wanted to collect actual data to support the suspicion. Their goal was to prove that a small change in a web form would lead to an increase in the form registration conversion rate. The hypothesis (supported by experts…) was that by reducing the number of form fields, the conversion rate would increase. If they could show a significant increase in conversion rate by making small changes to a form, they would revise the entire purchasing process. The original form had 17 form fields. They reviewed the form fields and chose to remove 3 fields immediately; account number, phone number and phone number evening. The goal was to remove even more fields, but this was difficult due to technical limitations. The tests showed that when you reduce the number of unecessary fields in a form, you increase the number of registration. The test also shows that it´s not optimal to remove too much information from a form. The most important consequense of this small test is that the company now understands the importance of fast registration processes. Within a few months, more key processes will be analyzed and simplified to increase online sales. This entry was posted in conversion rates and tagged conversion rate. Bookmark the permalink. Very insightful case study KP. Would you be interested in posting this on the Visual Website Optimizer case studies section? I think it would be very useful for our visitors. Insightful case study KP. Would you be interested in also posting this on the VWO blog? I think it would be very useful for our visitors. Pingback: Hva er A/B-testing (splitt-testing)?